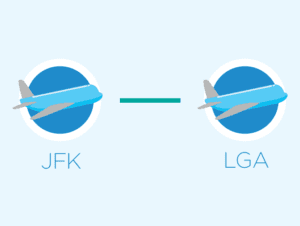 JFK and LaGuardia are about 14.5 kilometres apart and taking either a yellow cab at the airport or booking a car service beforehand is a good option. The prices are around the same but if you are travelling with more people it is cheaper to pre-book a car service (a Minivan or a Van) as a yellow cab has a maximum of three passengers. Booking online can save time and will give you peace of mind if you have to get to the other airport on time. When booking this private inter-airport transfer from John F. Kennedy International Airport (JFK) to LaGuardia Airport (LGA) or vice versa, you will need to fill in your flight details to complete your reservation. You can choose either a Sedan for up to three passengers, a Minivan for up to five passengers, or a Van for up to nine passengers. All you need do upon your arrival is to present your travel voucher to the driver. Note that this is a private inter-airport transfer which means that the price is the same regardless of the amount of people travelling. Thus when you are travelling with more people the cost per person will be cheaper.